Hyundai Verna Fluidic is the most successful sedan model in India and it has created waves across the auto market with its groundbreaking Fluidic body design. The South Korean automobile company has introduced this particular sedan class model with both petrol and diesel engine options. The Hyundai Verna Fluidic 1.4 EX is one of the entry level diesel variants in its model series and it is powered by the 1.4-litre CRDi diesel power plant that produces 1396cc displacement capacity. This particular variant is being offered with wide range of comfort features as well as safety aspects. One should talk about the interior section of this sedan, which is extremely spacious and incredibly comfortable. Hyundai is well known for designing class leading interiors with close finishes that creates a plush cabin environment. Despite one of the base level variants, the Hyundai Verna Fluidic 1.4 EX has been bestowed with great amount of features such as high gloss black and woodgrain interiors, chrome interior package, power windows with driver side auto down function, automatic AC unit and lots more. As far as safety aspects are concerned, this particular trim has been blessed with driver airbag, ABS with EBD, rear disc brakes, clutch lock system and several other sophisticated aspects. This sedan comes with the groundbreaking Fluidic body design and structure that makes it look unique in comparison to other sedans. This Fluidic body structure has caught the attention of many car enthusiasts. To start with the frontage, the design of the headlight cluster is quite fascinating that is complimented by the expressive lines on the bonnet. The front radiator grille is very large and it comes with a hexagonal design that amplifies the premium look of the front profile. This radiator grille has been decorated with the chrome plated strip along with the company logo. The bumper has been painted in body color and it comes with a built in fog lamps that gives extra visibility while adding to the style of Verna. The side profile of this premium sedan will certainly steal your attention with its fluidic body structure and design. The wheel arches of this sedan has been fitted with 15 inch steel wheels, which are further fitted with full wheel covers. The door handles and the ORVMs have been painted in body color. Coming to the rear profile, you can find that the boot lid is very stylish and its fludic structure dominates the entire profile. The taillight cluster is also looks striking while the bumper gets the sporty element, all together make the rear profile look like a next generation vehicle. 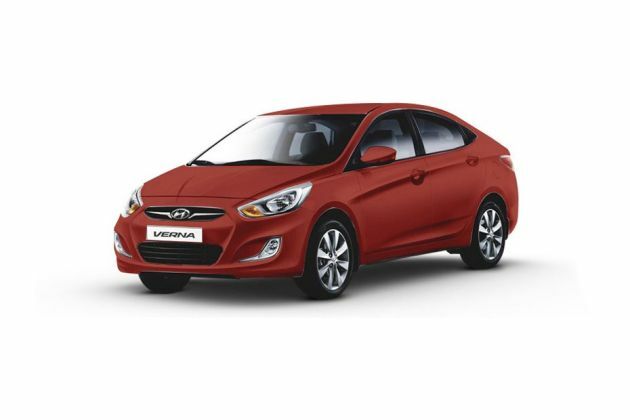 This Hyundai Verna Fluidic 1.4 EX trim also has the great interior design with plush environment that gives the occupants a luxurious experience. The interiors of this sedan comes with a dual tone high gloss black and woodgrain interiors, which is further complimented by the Blue interior illumination. Also the inside section comes with a chrome package that accentuates the interiors and gives a rich feel to all the occupants. The seats inside the cabin are very comfortable that offers a great support to the body. These seats have been covered with premium fabric upholstery. The steering wheel inside the cabin is very stylish and it is decorated with the Hyundai logo along with a unique design strip with silver garnish. Apart from these, you can find various set of features such as an AC unit, power windows, driver information display, front seat back pockets, sunglass holder, driver and passenger vanity mirror, theater dimming interior lamp, cooled glove box and lots more. The Hyundai Verna Fluidic 1.4 EX diesel trim has been powered by the 1.4-litre DOHC based diesel engine that comes with 1396cc displacement capacity. The company engineered this power plant with 4 cylinders, 16-valves and incorporated a CRDi fuel supply system that allows it to unleash a commanding power. The power produced by this engine is 88.8bhp at 4000rpm at the same time it can generate a peak torque output of about 219.9bhp in between 1750 to 2750rpm. This CRDi engine has been paired to a 5-speed manual transmission gearbox that distributes the torque to the front wheels. On the other hand, this engine is considered one of the most fuel efficient engines in its class with a best in class mileage figures of about 23.5 Kmpl. The new Hyundai Verna Fluidic 1.4 EX diesel trim comes with highly efficient braking mechanism. All its four wheels have been fitted with disc brakes and they receive the further assistance from the anti lock braking system with electronic brake-force distribution system. This will help the driver to enjoy a skid-free driving experience even at the sharp curves. Furthermore, its speed sensitive steering system doesn't need much of efforts by the driver when steering the vehicle at low speed conditions. As far as the suspension system is concerned, the front axle comes fitted with McPherson Strut type of suspension whereas its rear axle comes fitted with couple torsion beam axle type of suspension mechanism. The coil springs and stabilizer bars fitted to the front axle will further enhances its load capacity and its ability absorb jerks on the road. Despite being one of the low end variants, Hyundai Verna Fluidic 1.4 EX diesel trim comes with some of the top class comforts and conveniences. The company is offering this entry level variant with an exciting list of features including key less entry function integrated on folding key, rear view camera with display on ECM, rear parking sensor, Bluetooth connectivity with steering mounted call controls, an automatic air conditioning system with clean air function, electro chromic inside rear view mirror, electrically adjustable ORVMs and lots of others. Also, this particular variant is being offered with electric power steering with tilt function, front seat back pocket, theater dimming interior lamp, height adjustable front seat belts and tons of others. The safety features of this vehicle includes driver airbag, anti lock braking system with electronic brake-force distribution system, impact sensing auto door unlock, front fog lamps, central locking system, engine immobilizer system, clutch lock system and other sophisticated aspects. Pros : Great body design and structure, marvelous interior design. Cons : Price is high, more comfort features can be added.